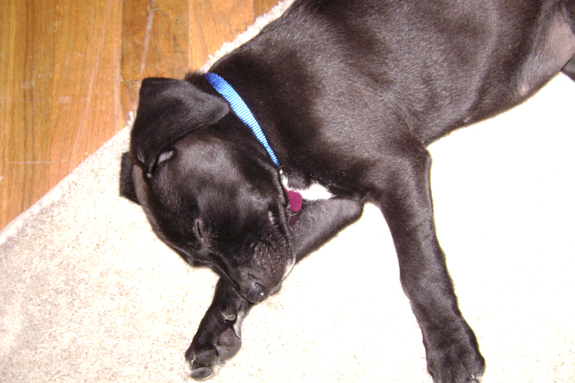 Callie was about 8 weeks old when she was thrown out of a car in a fast food restaurant parking lot. Not simply thrown out: The guy got out of the car and kicked her, got back in his car and left her in the parking lot. Some employees at this restaurant saw it, and she was rescued by a friend of mine who is a manager there. He said when he got her home, she was so dehydrated that her skin stuck to her bones. He and his partner kept her for a few days debating what to do with her. They have two other dogs and cats and busy jobs. They were hoping to find a good home for her. Enter me. They knew I had just lost my beloved Labrador, Ozzie, who’d been sick for some time and finally crossed the rainbow bridge. I was intending to wait several months before adopting. I have a wonderful cat, but it’s just not the same. Eight days after losing the Great and Powerful Oz, I was talking to one of the two guys who had Callie (as yet unnamed) and said I was going to go to the local humane society and look at adopting. The house was just too empty. He told me this puppy’s story, and it tugged my heart strings. Yes, I’d look at her and consider adopting her, I told him. He went right home, scooped her up and brought over for me to see. Oh, my, dog! She was so tiny and cute and snugly and simply sweet. Who can say no to such a tiny precious puppy? Not this sucker. I asked them to keep her a couple more days so I could take her when I had a day off to spend time with her. No problem. I picked her up on a Tuesday morning, and by Tuesday night I was head over heels in love. Callie had that amazing puppy enthusiasm, unbridled and excited about every single thing she encountered. One of the guys mentioned in passing that she was probably a pit bull, but likely had some Lab in her. I nodded and moved on, passing right over the pit bull part. Her energy level was turned up full blast! I started calling her Callie Full Throttle. Callie means beautiful and lovely in Greek. She was a beautiful, lovely, happy, crazy puppy! Then it got serious. I took her over to meet my parents. The conversation turned to the fact that she would become a dangerous dog as she got older. Not “if” she attacked someone, but “when” she attacked and what the cost would be to me. 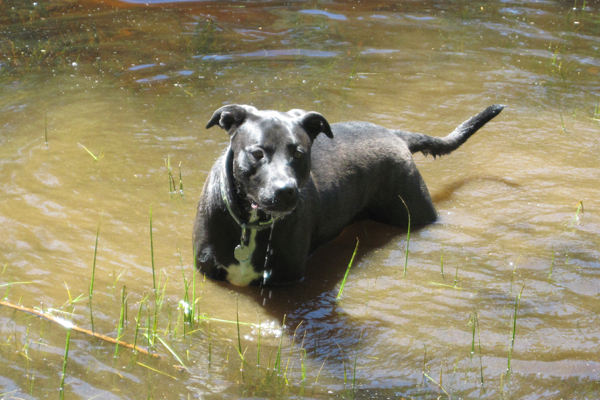 Know this: I grew up in Boulder, and we lived in the shadow of Denver’s breed-discriminatory legislation (BDL) for years and the media blitz that sensationalized these dogs as vicious killing machines, with no good endings for anyone involved with them. My parents believed it. I believed it. Pit bulls are a menace to society. Nasty, mean dogs at their core. After visiting with my parents, I brought my new little girl home. I got on the Web and began searching pit bull pictures. Looking at the pictures, she sure looked like one. Well, hell. Now what? I kept researching. I found a link to BADRAP and started reading about the dogs rescued from Michael Vick’s fighting operation. The gag order had recently been lifted, and the news was looking good for all the dogs who were saved. BADRAP’s site linked me to Best Friends Animal Society in Utah and more Vick dogs, as well as stories about other pit bulls, which linked me to Pit Bull Rescue Central and their work to educate and teach responsible guardianship, which led me to many more websites, and other people working to save these dogs and show the world the positive news about pit bulls. The good news about pit bulls was endless. So why enact BDL that has cost hundreds of thousands of dogs their lives? Why the horrible stories? The media, politicians, nefarious humans who abused them and community ignorance. I fell in the ignorance category to be sure. I read and I read, and I looked at my puppy and made a very conscious decision that if pit bulls from an abusive fighting operation, as well as others who’d been abused, could be saved and helped to become productive members of society, then this dog had every chance to be a good dog. It was up to me to take responsibility. So I did. I jumped right on the bandwagon of changing perceptions about pit bulls. Including mine. I have never been sorry. I feel sorry for people who are subjected to me now, as I attempt to proselytize them about the awesomeness of pit bull type dogs. We are lucky to live in a community that doesn’t have much fear about pit bulls, although, the drums of BDL beat faintly once in a while, quickly quashed by more reasonable heads. That is why it is up to me to continue to be a responsible guardian. I started socializing Callie with other dogs – big, little, medium, fat, skinny. You name it, we hung around it. On purpose. The area I live in has 1.3 million acres of Bureau of Land Management land that has been modified with multipurpose trails everywhere. We hike daily. She’s an awesome trail dog. We have met every type of dog out there, including other pit bulls. This is a county that values dogs highly and people are pretty responsible. Callie has terrific manners. Trail dogs know how to behave and be social and non-threatening. We are there to exercise, not cause trouble. We hike every single day no matter the weather. 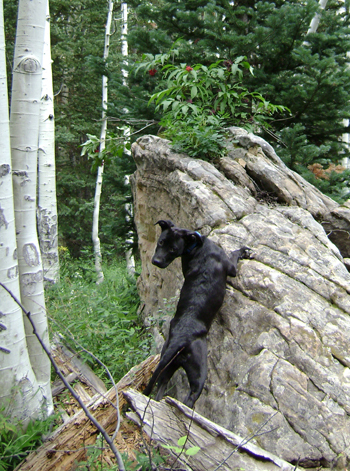 We visit with other hikers and socialize with other dogs. All by design. My dog is the consummate social butterfly. I have read everything I can about these dogs. Yet, we didn’t begin formal obedience until she was 2. I wanted to be a better pack leader, more consistent. I am far from the perfect dog guardian, but she takes it very easy on me. We have found we like doing obedience for the fun of it and the socialization. Last year I started thinking about how to get more involved in the community. Volunteering appeals to me on a certain level. I work full time and am away from Callie a good chunk of the day now anyway, so I didn’t want to take more time than I had to. I became interested in getting her certified to do therapy work, as I have followed more and more pit bulls on Facebook, including StubbyDog.org, who are currently doing fantastic jobs and telling great stories. As she has gotten older and calmer, I began to believe that she can do it. This is something we can do together and fulfill my need to give back and her desire to be around people. Callie is almost 4 now. We just passed our Canine Good Citizen test and therapy dog initial evaluation. It was an opportunity that came quickly after I decided we should pursue it. I received a call on a Friday night, and we tested Saturday morning at a local busy park. I looked at her as we got to the park and said, “OK, Callie, this is where the rubber meets the road.” I often talk to her like she’s a human friend. She didn’t look at me, but I knew she was listening and getting in the mode. I’ve seen her do it before. She puts on her “game face.” Callie had never been exposed to durable medical equipment before the test but did great. She was fabulous with the kids in the park, not having been around many children. The ladies doing the testing and other dogs participating were all easy for her to win over. The evaluators commented more than once about what a good dog she is. She dialed in and hit a home run. I am crazy proud of her. We have further to go, but we are well on our way to becoming an awesome therapy team! when i brought my first pit bull home 4 years ago, my parents werent very happy. my mom wouldnt even walk passed my dog (who was a timid and previously abused puppy) and now I am PLEASED to say, my mom has 2 pits, my brother now has a pit and i have 3 myself 🙂 changing perceptions one day at a time!!!! @lovabull Yay! A pit bull family, we love it! Great story…well written! We should hike sometime, I am just outside of Boulder. I was just reminded by my Mother that I forgot to mention that my Dad is quite smitten with Callie. He was the strongest proponent of my not keeping her, and now he thinks she’s pretty cool. Kallie, I’d love to hike with you, but these days I’m living in Grand Junction…so if you’re ever in the area, Callie and I would love for you to join us! @ShawnLowe Shawn…I’ll do that! I have a a rescue pit named, Journey. Everyone she encounters have changed hearts and minds about pitbulls…she’s just a mass of waggily, happy smiles! Even my hardened, judgemental aunt whom professed upon her meeting (finally) with Journey, “I can’t believe she’s so calm and sweet”. To my amazement (and horror)…I couldn’t believe she was serious! I mean, seriously, what the heck do people think and how ignorant can they be? Dogs like Callie and Journey are just doing their jobs…one person at a time! Thanks for opening your heart and home to Callie! OMG every single pic you posted of her she could be my pup’s twin….from the eyes, to the lil feminine like sleek head…to the white-tipped paws..I bet i could convince anyone in my family those were pics of my dog…and they are about the same age also…your story is inspiring..and motiviating…I have often thought of the canine good cit. training as well…I would love to get her to be a therapy dog at some point becuase of her great demeanor with people….I too was one of “those” people who completely changed my viewpoint and decided to educate myself on the happenning in re: to pitbulls across the country….thank you for the great story! What a wonderful story! If more people took the initiative you did to look past the propaganda, society would be a better place. @dragondix2 So agree. And now part of my mission. Thank you for saying that. 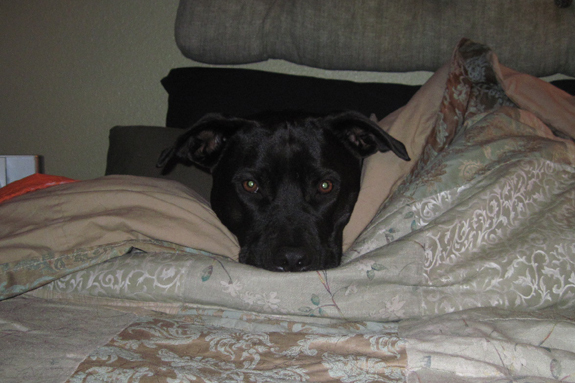 My little pit, Joan Jette (ski-doo) for short…don’t ask:-) looks like Callie as well. I am proud of your willingness to discover what joys they are without falling prey to misconceptions and discrimination. She is beautiful! Aw! Love the look on her face in the last picture. My dog often gives me that look too. So cute! Thank you for taking a chance on Callie. I too was a little apprehensive about my pittie when I got her. But I also told myself I would do whatever it took to ensure Kyah was a great dog. And she is! She is 3 now and so sweet and loving. Loves to play with dogs, likes kids and just loves any person she meets. She does her happy tail dance and wiggles around. Everything from just walking into a room, to going to a walk is a party for her. 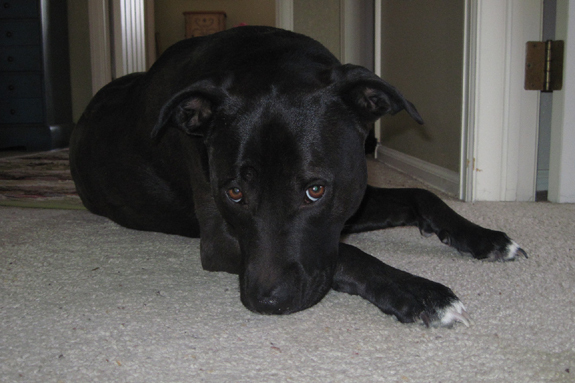 @avegas72 Kyah sounds like a wonderful girl and a typical pit bull. If you want to share your story about Kyah with us and our readers, please email [email protected] and send photos. Your story is just the kind that we love to post! @StubbyDog @avegas72 Yeah! I was hoping for more on Kyah! Callie Full Throttle’s pictures are so cute!